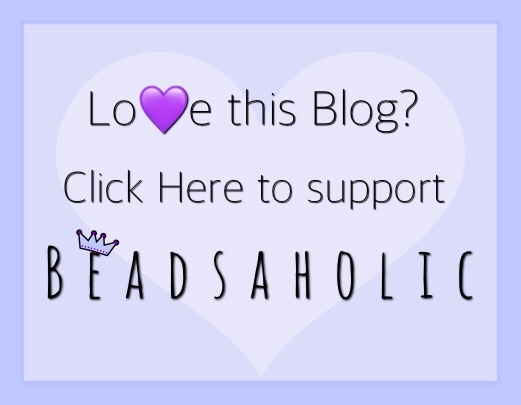 Today Beadsaholic brings a review of the latest collection from Trollbeads. Today Trollbeads introduces their latest collection Stardust Winter Collection for 2018. This collection consists of four new glass beads, a stone, two Christmas silvers, two heart silvers, two star silvers, one gold bead, a pendant, ring and a new bangle! This collection is set to release on November 2, 2018. Trollbeads Green Twinkle has a beautiful green core encased in a golden amber color with sparkly glitter floating about. This is a standard size bead with a classic core. Green Twinkle retails for $55 / €55 / £50, European prices include vat. Trollbeads Yellow Twinkle has a beautiful creamy core encased in a golden amber color with sparkly glitter floating about. This is a standard size bead with a classic core. Yellow Twinkle retails for $55 / €55 / £50, European prices include vat. Trollbeads Blue Twinkle has a beautiful deep blue core encased in a golden amber color with sparkly glitter floating about. This is a standard size bead with a classic core. Blue Twinkle retails for $55 / €55 / £50, European prices include vat. Trollbeads Red Twinkle has a beautiful red core encased in a golden amber color with sparkly glitter floating about. This is a standard size bead with a classic core. Red Twinkle retails for $55 / €55 / £50, European prices include vat. Trollbeads Pyrite is a beautiful reflective stone with a golden hue. This is a standard size bead. It is a genuine stone so, like all stones they can vary and have unique inclusions. Pyrite retails for $65 / €65 / £60, European prices include vat. Trollbeads More Cookie Joy is an adorable bead with different little cookie cutter shapes. This bead measures approximately 13.47 mm high x 12.54 mm wide and retails for $55 / €55 / £50, European prices include vat. Here you see the Tiny Cookie Joy and the More Cookie Joy side by side for size comparison. Trollbeads Tiny Cookie Joy is like the Trollbeads More Cookie Joy Bead as it has cute cookie cutters throughout, this bead is just smaller. Tiny Cookie Joy measures approximately 11.94 mm high x 10.70 mm wide and retails for $45 / €45 / £40, European prices include vat. Trollbeads Blanket of Love is an open-work hearts design and size wise would balance the Tiny Cookie Joy on a bracelet nicely. Blanket of Love measures approximately 11.01 mm high x 10.48 mm wide and retails for $35 / €35 / £30, European price includes vat. Trollbeads Blanket of Love is also available in gold. Trollbeads Come Together is a Kim Buck design and reminds me of a cosmic twist. I truly love his abstract designs. Come Together measures approximately 12.94 mm high x 6.91 mm wide and retails for $45 / €45 / £40, European prices include vat. Trollbeads Stardust is another great Kim Buck entwined star design! I really love this design and it’s perfect paired with the Come Together. Stardust measures approximately 12 mm high x 7.02 mm wide and retails for $45 / €45 / £40, European prices include vat. Trollbeads Heart to Heart is a double-sided heart design with a smaller heart inside each heart. I love that there is a matching pendant. Heart to Heart measures approximately 9.59 mm high x 11.72 mm wide and retails for $35 / €35 / £30, European prices include vat. Trollbeads Heart to Heart Pendant is a cute design that matches the smaller Heart to Heart bead perfectly. This pendant is perfect for a Trollbeads Fantasy chain and will allow a bead to sit within the pendant. Heart to Heart measures approximately 16.72 mm high x 19.61 mm wide and retails for $65 / €65 /£60, price includes vat. Here I have paired the Heart to Heart Pendant with the Trollbeads Pyrite stone on a Peacock Pearl Fantasy Necklace. Trollbeads Cookie Ring is too adorable and perfect for Christmas! This ring comes in ten sizes and retails for $55 / €55 / £50, European prices includes vat. Trollbeads Heart Bangle is such a unique design, on each end of the bangle you will find a heart. Heart bangle weighs approximately 11.28 g. This bangle comes in sizes from XXS to L and retails for $105 / €105 / £95, European prices include vat. I find that the Heart bangle is a tad thinner than previously released bangles from Trollbeads. I really love these together. I think the glass together with the new silvers make the perfect Christmas bracelet. Here I have combined the new Kim Buck Silvers, Diamond Amber, Yellow Twinkle, Blue Twinkle from the latest release with some older Trollbeads. I am also including a video to show the details of this collection. The lighting is a bit dim as it was close to dusk. Over all, I think this is a nice collection that will mix nicely with some of the Autumn release as well as the release from Winter 2017. If you would like to preorder today you may do so at any of the following links. 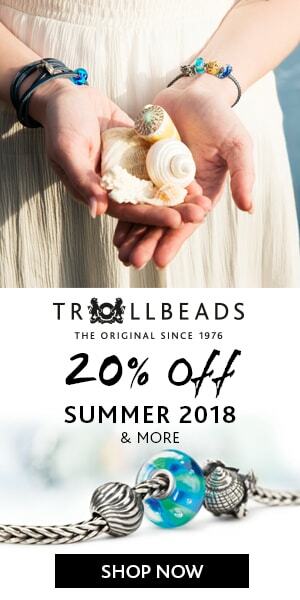 Trollbeads USA is an affiliate link and only ships within the USA. All other shops ship world-wide. ← Review: Spiritbeads Kokeshi’s Lantern! That full bracelet is stunning Paula. I had my eye on the pyrite and blue twinkle this morning but that red twinkle glass is really stunning as well, such a beautiful, deep red. I would eventually love to own all four glass, as I think I would use them a lot. Not sure why but for the last year or so I’ve had a strong preference for Trollbead’s faceted glass, it’s just so striking and modern looking. Will definitely be picking up the tiny cookie jar as well. Nice to see some more modern colors and shapes entering the catalog. Thanks so much, Tanya! I think you will get a lot of use out of the glass and Pyrite. I find that they look good with a lot. I was most excited to see that Blue Twinkle as well, thinking it will go nicely with my sapphire and lapis. I need more time to play 😉 I’d love to see what you create when you receive yours! Tag me! It’s a lovely collection, your video was a perfect showcase! I particularly like the small silver heart and the pyrite bead. Thanks so much, Jo! The pyrite bead is such a great addition to the stones collection, I’m looking forward to playing with this one. May need a second! lol.. I’ve been wearing the Heart to Heart on the new bangle and I really like it. I think I want everything (except for the ring maybe). The glass is very beautiful, and I think they are versatile enough to justify buying all four. Yes! Totally agree, the glass is very versatile and will look fantastic with some of the stones and previous releases, the glass isn’t too busy so it will be easy to work with. The silvers are really nice too, I’m especially loving Come Together and Stardust. The ring is cute and perfect for Christmas, not sure if it will get worn much otherwise.